I’m always on the lookout for new additions to my archaeology kit bag, and I got these from 99 Ranch, a local Asian supermarket. 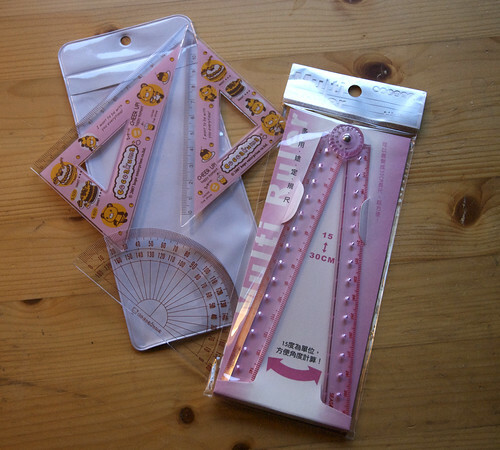 The ruler is particularly exciting, as it makes a great ratcheting noise when opening and has holes so you can mark precisely at each centimeter. I did a lot of drawing this summer, but didn’t bring any of my own supplies so I was using the side of a plastic compass for a straight-edge, which was wholly unsatisfying. And they’re pink with horrible pandas, which will surely bring groans from fellow archaeologists. Yaaay! All of this for about $3. Not bad. Awesome, and sure to bring groans. And for a buck, if you lose something or it breaks, oh well, it was just a buck! Not like a $25 Stanley tape measure. Fantastic! Everyone should have one of those… I picked up a folding wooden tape measure once, at a market in Rome. Turned out to be useless for just about everything – except for inter-trench light sabre wars.